Autumn White- Beautiful, Resilient 3cm PREMIUM First Grade Autumn White is a popular type of granite. Autumn White granite displays as a creamy white stone with sometimes beautiful characteristics of small gold ribbons, white wisps and black and raspberry specks. Autumn White and is an attractive choice for kitchen counters, fountains or restaurant usage. Color: Creamy white with hints of gold, white, raspberry and black Characteristics: Beautiful, Resilient, Stain and Scratch Resistant Popularity: Strong residential markets and builder's choice granite Cabinets:Autumn White goes with most wood stains and medium or dark colored cabinets Grade: 1st grade, Premium Select Thickness: 3cm *Autumn White is a safe color for marketability and real estate investments. Remember to input the true (or best estimate) square footage amount in sq.ft box. A typical kitchen is 40-75 square feet. Kitchens with islands and bar tops can be significantly more. Vanity tops are typically 20-50 sq.ft. Also remember to calculate any backsplash (4 inch typical or full backsplash) in the total square footage. Click here to learn how to measure and calculate your countertops's true square footage. BALTIC BROWN- Beautiful, Resilient 3cm PREMIUM First Grade Baltic Brown is a very popular type of granite. Baltic Brown granite displays as an earthtone stone with a beautiful chocolate brown to light brown and black base with characteristics of brown spongy cork-like patches and black spots, with a very uniform or consistent pattern throughout the stone. Baltic Brown is an attractive choice for kitchen counters,fireplaces or commercial usage. Color: Chocolate/light brown and black base with characteristics of spongy cork-like patches and black spots Characteristics: Beautiful, Resilient, Stain and Scratch Resistant Popularity: Strong residential markets and commercial choice granite Cabinets: Baltic Brown goes with most light to medium wood stains and white or light colored cabinets Grade: 1st grade, Premium Select Thickness: 3cm, 2cm *Baltic Brown is a safe color for marketability and real estate investments. Remember to input the true (or best estimate) square footage amount in sq.ft box. A typical kitchen is 40-75 square feet. Kitchens with islands and bar tops can be significantly more. Vanity tops are typically 20-50 sq.ft. Also remember to calculate any backsplash (4 inch typical or full backsplash) in the total square footage. Click here to learn how to measure and calculate your countertops's true square footage. 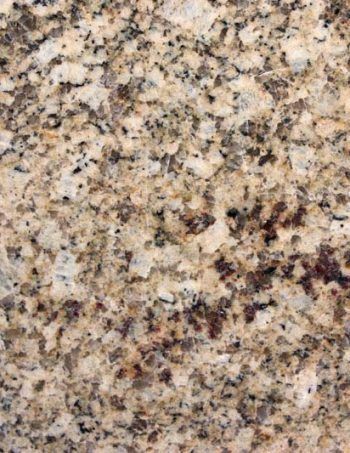 MEDINA BROWN- Beautiful, Resilient 3cm PREMIUM First Grade Medina Brown is a very popular type of granite. Medina Brown granite displays as an earthtone stone with a beautiful brown to medium shades with characteristics of brown spongy cork-like patches and black spots, with a very uniform or consistent pattern throughout the stone. Medina Brown is an attractive choice for kitchen counters,fireplaces or commercial usage. Color: Medium brown and black base with characteristics of spongy cork-like patches and black spots Characteristics: Beautiful, Resilient, Stain and Scratch Resistant Popularity: Strong residential markets and commercial choice granite Cabinets: Medina Brown goes with most light to medium wood stains and white or light colored cabinets Grade: 1st grade, Premium Select Thickness: 3cm, 2cm *Medina Brown is a safe color for marketability and real estate investments. Remember to input the true (or best estimate) square footage amount in sq.ft box. A typical kitchen is 40-75 square feet. Kitchens with islands and bar tops can be significantly more. Vanity tops are typically 20-50 sq.ft. Also remember to calculate any backsplash (4 inch typical or full backsplash) in the total square footage. Click here to learn how to measure and calculate your countertop's true square footage. SANTA RITA- Beautiful, Resilient 3cm PREMIUM First Grade Santa Rita is a very popular type of granite. Santa Rita granite displays as an earthtone stone with beautiful beige, cafe brown and gold base with characteristics of black, gray and white patterns with infrequent burgundy/brown crystal speckled throughout the stone. Santa Rita is an attractive choice for kitchen counters,fireplaces or commercial usage. Color: Beige, cafe brown and gold base- black, gray, white patterns with burgundy/brown crystal bursts Characteristics: Beautiful, Resilient, Stain and Scratch Resistant Popularity: Strong residential markets and commercial choice granite Cabinets: Santa Rita goes with most light to medium wood stains and colored cabinets Grade: 1st grade, Premium Select Thickness: 3cm, 2cm *Santa Rita is a safe color for marketability and real estate investments. Remember to input the true (or best estimate) square footage amount in sq.ft box. A typical kitchen is 40-75 square feet. Kitchens with islands and bar tops can be significantly more. Vanity tops are typically 20-50 sq.ft. Also remember to calculate any backsplash (4 inch typical or full backsplash) in the total square footage. Click here to learn how to measure and calculate your countertop's true square footage. GIALLO ORNAMENTAL- Beautiful, Resilient 3cm PREMIUM First Grade Giallo Ornamental Light is a popular type of granite. Giallo Ornamental Premium granite displays as an earthtone stone with beautiful lighter beige/brown base and characteristics of beige and white patterns with chocolate chip brown spots speckled throughout the stone. Giallo Ornamental Premium has less exotic anomalies and is an attractive choice for kitchen counters,fireplaces or commercial usage. Color: Lighter beige/brown base- beige and white patterns with chocolate chip brown speckles Characteristics: Beautiful, Resilient, Stain and Scratch Resistant Popularity: Strong residential markets and commercial choice granite Cabinets: Giallo Ornamental Premium goes with most medium to dark wood stain or colored cabinets Grade: 1st grade, Premium Select Thickness: 3cm, 2cm *Giallo Ornamental Premium is a safe color for marketability and real estate investments. Remember to input the true (or best estimate) square footage amount in sq.ft box. A typical kitchen is 40-75 square feet. Kitchens with islands and bar tops can be significantly more. Vanity tops are typically 20-50 sq.ft. Also remember to calculate any backsplash (4 inch typical or full backsplash) in the total square footage. Click here to learn how to measure and calculate your countertop's true square footage. GIALLO VENEZIANO- Beautiful, Resilient 3cm PREMIUM First Grade Giallo Veneziano is a popular type of granite. Giallo Veneziano Premium granite displays as an earthtone stone with beautiful light cinnamon brown base and characteristics of beige, yellow and black spots speckled throughout the stone. Giallo Veneziano Premium has less exotic anomalies and is an attractive choice for kitchen counters,fireplaces or commercial usage. Color: Lighter cinnamon brown base- beige, yellow and brown/black speckles Characteristics: Beautiful, Resilient, Stain and Scratch Resistant Popularity: Strong residential markets and commercial choice granite Cabinets: Giallo Veneziano Premium goes with most light to dark wood stain or colored cabinets Grade: 1st grade, Premium Select Thickness: 3cm, 2cm *Giallo Veneziano Premium is a safe color for marketability and real estate investments. Remember to input the true (or best estimate) square footage amount in sq.ft box. A typical kitchen is 40-75 square feet. Kitchens with islands and bar tops can be significantly more. Vanity tops are typically 20-50 sq.ft. Also remember to calculate any backsplash (4 inch typical or full backsplash) in the total square footage. Click here to learn how to measure and calculate your countertop's true square footage. GIALLO VITORIA- Beautiful, Resilient 3cm PREMIUM First Grade Giallo Vitoria Light is a popular type of granite. Giallo Vitoria Premium granite displays as an earthtone stone with beautiful lighter beige/brown base and characteristics of beige and white patterns with chocolate chip brown spots speckled throughout the stone. Giallo Vitoria Premium has less exotic anomalies and is an attractive choice for kitchen counters,fireplaces or commercial usage. Color: Lighter beige/brown base- beige and white patterns with chocolate chip brown speckles Characteristics: Beautiful, Resilient, Stain and Scratch Resistant Popularity: Strong residential markets and commercial choice granite Cabinets: Giallo Vitoria Premium goes with most medium to dark wood stain or colored cabinets Grade: 1st grade, Premium Select Thickness: 3cm, 2cm *Giallo Vitoria Premium is a safe color for marketability and real estate investments. Remember to input the true (or best estimate) square footage amount in sq.ft box. A typical kitchen is 40-75 square feet. Kitchens with islands and bar tops can be significantly more. Vanity tops are typically 20-50 sq.ft. Also remember to calculate any backsplash (4 inch typical or full backsplash) in the total square footage. Click here to learn how to measure and calculate your countertop's true square footage. 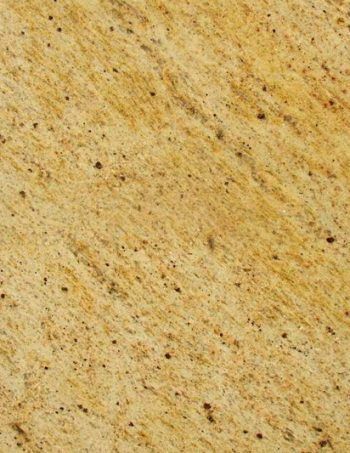 GOLDEN RUSTIC- Beautiful, Resilient 3cm PREMIUM First Grade Golden Rustic is a popular type of granite. Golden Rustic Premium granite displays as an earthtone stone with beautiful creamy beige base with very pronounced rusty gold and orange splash patterns throughout the stone. Golden Rustic Premium has a lot of exotic anomalies and is an attractive choice for kitchen counters,fireplaces or commercial usage. Color: creamy beige base with rusty gold and orange stain patterns- beige, gold and orange Characteristics: Beautiful, Resilient, Stain and Scratch Resistant Popularity: Strong residential markets and commercial choice granite Cabinets: Golden Rustic Premium goes with most light to dark wood stain or colored cabinets Grade: 1st grade, Premium Select Thickness: 3cm, 2cm *Golden Rustic Premium is a safe color for marketability and real estate investments. Remember to input the true (or best estimate) square footage amount in sq.ft box. A typical kitchen is 40-75 square feet. Kitchens with islands and bar tops can be significantly more. Vanity tops are typically 20-50 sq.ft. Also remember to calculate any backsplash (4 inch typical or full backsplash) in the total square footage. Click here to learn how to measure and calculate your countertop's true square footage. 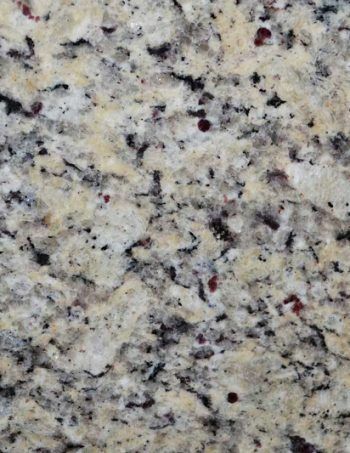 KASHMIR WHITE- Beautiful, Resilient 3cm PREMIUM First Grade Kashmir White is a popular type of exotic granite. 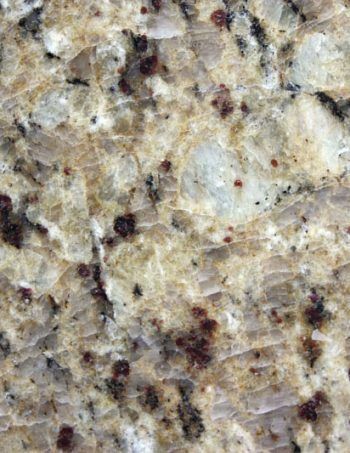 Kashmir White granite displays as an light sandy white stone with a beautiful brown and burgandy cyrstal bursts and a very uniform pattern throughout the stone. Kashmir White is an attractive choice for kitchen counters,fireplaces or commercial usage. Color:Light sandy white stone with a beautiful brown and burgandy cyrstal bursts and a very uniform pattern Characteristics: Beautiful, Resilient, Stain and Scratch Resistant Popularity: Strong residential markets and commercial choice granite Cabinets: Kashmir White goes with most medium to dark wood stains and colored cabinets Grade: 1st grade, Premium Select Thickness: 3cm, 2cm *Kashmir White is a safe color for marketability and real estate investments. Remember to input the true (or best estimate) square footage amount in sq.ft box. A typical kitchen is 40-75 square feet. Kitchens with islands and bar tops can be significantly more. Vanity tops are typically 20-50 sq.ft. Also remember to calculate any backsplash (4 inch typical or full backsplash) in the total square footage. Click here to learn how to measure and calculate your countertop's true square footage. 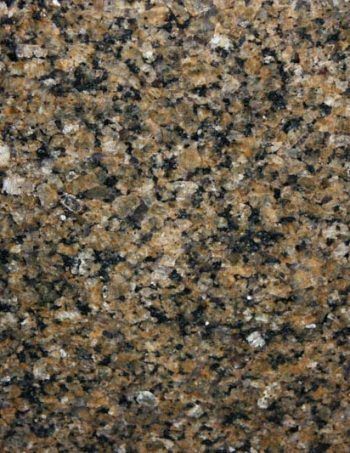 NEW VENETIAN GOLD- Beautiful, Resilient 3cm PREMIUM First Grade New Venetian Gold is a very popular type of granite. New Venetian Gold granite displays as an earthtone stone with beautiful beige, brown and gold base with characteristics of black, gray and white patterns with infrequent burgundy/brown crystal speckled throughout the stone. New Venetian Gold is an attractive choice for kitchen counters,fireplaces or commercial usage. Color: Beige, brown, gold base- black, gray and white patterns with infrequent burgundy/brown crystal speckles Characteristics: Beautiful, Resilient, Stain and Scratch Resistant Popularity: Strong residential markets and commercial choice granite Cabinets: New Venetian Gold goes with most light to medium wood stains and colored cabinets Grade: 1st grade, Premium Select Thickness: 3cm, 2cm *New Venetian Gold is a safe color for marketability and real estate investments Remember to input the true (or best estimate) square footage amount in sq.ft box. A typical kitchen is 40-75 square feet. Kitchens with islands and bar tops can be significantly more. Vanity tops are typically 20-50 sq.ft. Also remember to calculate any backsplash (4 inch typical or full backsplash) in the total square footage. Click here to learn how to measure and calculate your countertop's true square footage. GIALLO FIORIO- Beautiful, Resilient 3cm PREMIUM First Grade Giallo Fiorito is a very popular type of granite. 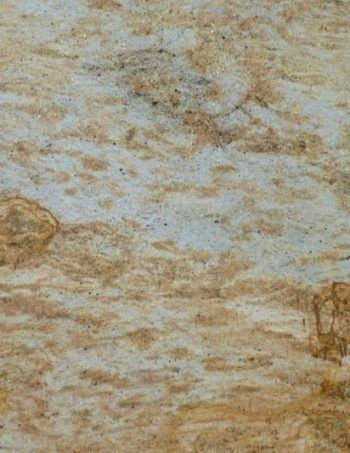 Giallo Fiorito granite displays as an earthtone stone with a beautiful brown to light brown and black base with characteristics of brown to beige spongy cork-like patches and black spots, with a very uniform or consistent pattern throughout the stone. Giallo Fiorito is an attractive choice for kitchen counters,fireplaces or commercial usage. Color: medium/light brown and black base with characteristics of spongy cork-like patches and black spots Characteristics: Beautiful, Resilient, Stain and Scratch Resistant Popularity: Strong residential markets and commercial choice granite Cabinets: Giallo Fiorito goes with most light to medium wood stains and white or light colored cabinets Grade: 1st grade, Premium Select Thickness: 3cm, 2cm *Giallo Fiorito is a safe color for marketability and real estate investments. Remember to input the true (or best estimate) square footage amount in sq.ft box. A typical kitchen is 40-75 square feet. Kitchens with islands and bar tops can be significantly more. Vanity tops are typically 20-50 sq.ft. Also remember to calculate any backsplash (4 inch typical or full backsplash) in the total square footage. Click here to learn how to measure and calculate your countertops's true square footage. 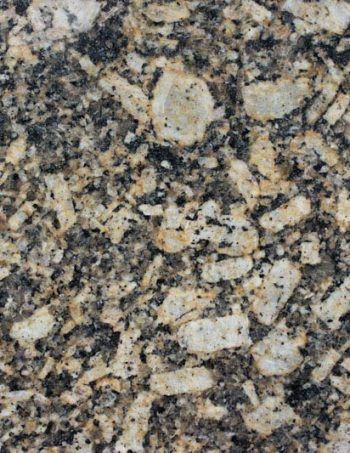 GIALLO NAPOLI- Beautiful, Resilient 3cm PREMIUM First Grade Giallo Napoli is a popular type of granite. Giallo Napoli granite displays as an earthtone stone with beautiful lighter beige/brown base and characteristics of beige, yellow and white patterns with chocolate chip brown spots speckled throughout the stone. Giallo Napoli has less exotic anomalies and is an attractive choice for kitchen counters,fireplaces or commercial usage. Color: beige/brown base- yellow and white patterns with chocolate chip brown speckles Characteristics: Beautiful, Resilient, Stain and Scratch Resistant Popularity: Strong residential markets and commercial choice granite Cabinets: Giallo Napoli goes with most medium to dark wood stain or colored cabinets Grade: 1st grade, Premium Select Thickness: 3cm, 2cm *Giallo Napoli is a safe color for marketability and real estate investments. Remember to input the true (or best estimate) square footage amount in sq.ft box. A typical kitchen is 40-75 square feet. Kitchens with islands and bar tops can be significantly more. Vanity tops are typically 20-50 sq.ft. Also remember to calculate any backsplash (4 inch typical or full backsplash) in the total square footage. Click here to learn how to measure and calculate your countertop's true square footage. 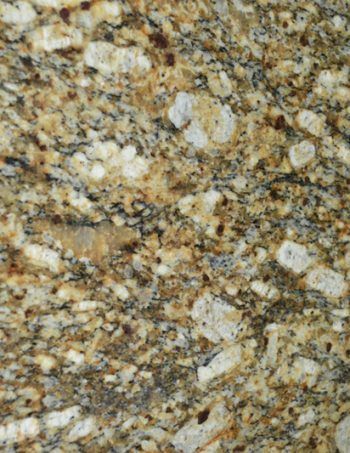 KASHMIR GOLD- Beautiful, Resilient 3cm PREMIUM First Grade Kashmir Gold is popular type of exotic granite. 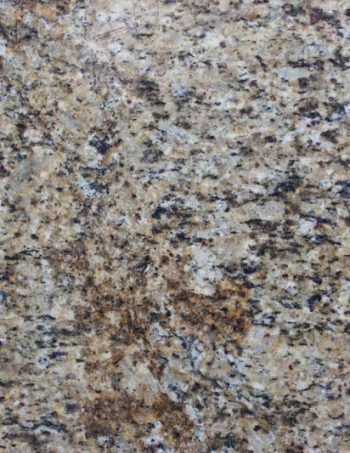 Kashmir Gold granite displays as a light sandy gold and white stone with beautiful beige, grey and burgundy/brown crystal speckled throughout the stone. Kashmir Gold is an attractive choice for kitchen counters,fireplaces or commercial usage. 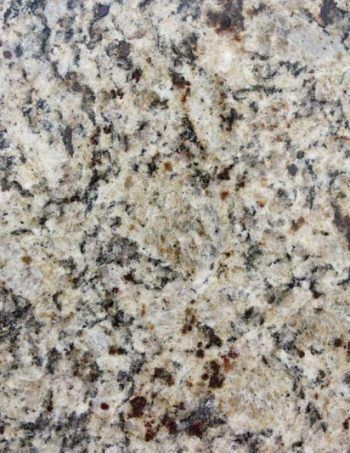 Color: Light sandy gold and white stone with beautiful beige, grey and burgundy/brown crystal speckles Characteristics: Beautiful, Resilient, Stain and Scratch Resistant Popularity: Strong residential markets and commercial choice granite Cabinets: Kashmir Gold goes with most medium to dark wood stains and colored cabinets Grade: 1st grade, Premium Select Thickness: 3cm, 2cm *Kashmir Gold is a safe color for marketability and real estate investments. Remember to input the true (or best estimate) square footage amount in sq.ft box. A typical kitchen is 40-75 square feet. Kitchens with islands and bar tops can be significantly more. Vanity tops are typically 20-50 sq.ft. Also remember to calculate any backsplash (4 inch typical or full backsplash) in the total square footage. Click here to learn how to measure and calculate your countertop's true square footage. 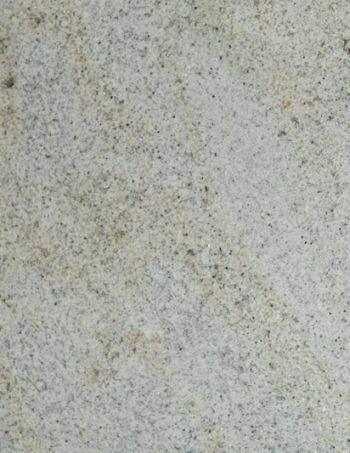 SANTA CECILIA CLASSIC- Beautiful, Resilient 3cm PREMIUM First Grade Santa Cecilia Classic is a very popular type of granite. Santa Cecilia Classic granite displays as an earthtone stone with beautiful beige, cafe brown and gold base with characteristics of black, gray and white patterns with infrequent burgundy/brown crystal speckled throughout the stone. Santa Cecilia Classic is an attractive choice for kitchen counters,fireplaces or commercial usage. 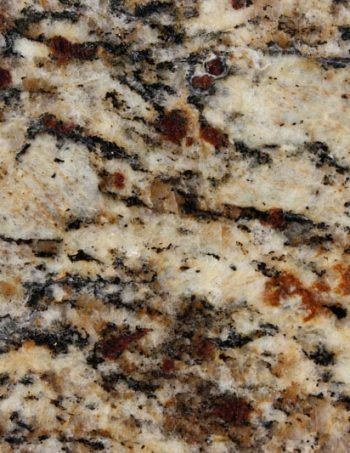 Color: Beige, cafe brown and gold base- black, gray, white patterns with burgundy/brown crystal bursts Characteristics: Beautiful, Resilient, Stain and Scratch Resistant Popularity: Strong residential markets and commercial choice granite Cabinets: Santa Cecilia Classic goes with most light to medium wood stains and colored cabinets Grade: 1st grade, Premium Select Thickness: 3cm, 2cm *Santa Cecilia Classic is a safe color for marketability and real estate investments. Remember to input the true (or best estimate) square footage amount in sq.ft box. A typical kitchen is 40-75 square feet. Kitchens with islands and bar tops can be significantly more. Vanity tops are typically 20-50 sq.ft. Also remember to calculate any backsplash (4 inch typical or full backsplash) in the total square footage. Click here to learn how to measure and calculate your countertop's true square footage. SANTA CECILIA LIGHT- Beautiful, Resilient 3cm PREMIUM First Grade Santa Cecilia Light is a very popular type of granite. Santa Cecilia Light granite displays as an earthtone stone with beautiful light beige, cafe brown and gold base with characteristics of black, gray and white patterns with infrequent burgundy/brown crystal speckled throughout the stone. Santa Cecilia Light is an attractive choice for kitchen counters,fireplaces or commercial usage. 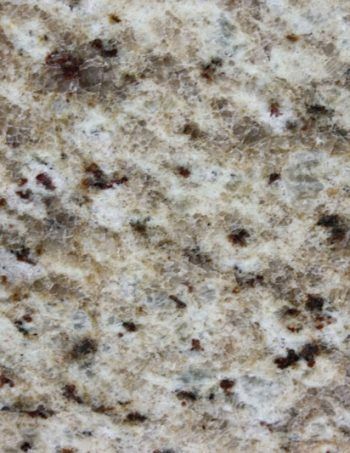 Color: light Beige, cafe brown and gold base- black, gray, white patterns with burgundy/brown crystal bursts Characteristics: Beautiful, Resilient, Stain and Scratch Resistant Popularity: Strong residential markets and commercial choice granite Cabinets: Santa Cecilia Light goes with most light to medium wood stains and colored cabinets Grade: 1st grade, Premium Select Thickness: 3cm, 2cm *Santa Cecilia Light is a safe color for marketability and real estate investments. Remember to input the true (or best estimate) square footage amount in sq.ft box. A typical kitchen is 40-75 square feet. Kitchens with islands and bar tops can be significantly more. Vanity tops are typically 20-50 sq.ft. Also remember to calculate any backsplash (4 inch typical or full backsplash) in the total square footage. Click here to learn how to measure and calculate your countertop's true square footage. VERONA- Beautiful, Resilient 3cm PREMIUM First Grade Verona is a very popular type of exotic granite. 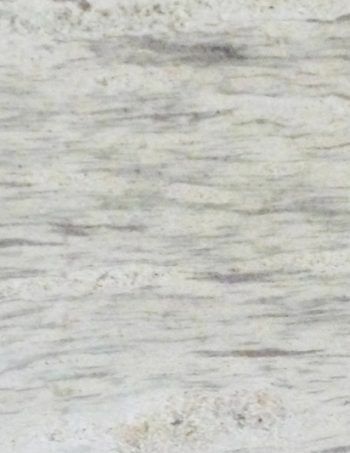 Verona granite displays as a beautiful creamy/gold, with patches of white and sometimes raspberry. This is considered an exotic pattern stone with patches and veining throughout the stone. Verona is an attractive choice for kitchen counters, fireplaces or commercial usage. Color: Gold/Creamy, White and Raspberry exotic stone with patches and veining Characteristics: Beautiful, Resilient, Stain and Scratch Resistant Popularity: Strong residential markets and commercial choice granite Cabinets: Verona goes with most light, medium to dark wood stains and colored cabinets Grade: 1st grade, Premium Select Thickness: 3cm, 2cm *Verona is a safe color for marketability and real estate investments. Remember to input the true (or best estimate) square footage amount in sq.ft box. A typical kitchen is 40-75 square feet. Kitchens with islands and bar tops can be significantly more. Vanity tops are typically 20-50 sq.ft. Also remember to calculate any backsplash (4 inch typical or full backsplash) in the total square footage. Click here to learn how to measure and calculate your countertops true square footage. ABSOLUTE BLACK- Beautiful, Resilient 3cm PREMIUM First Grade Absolute Black is a popular type of granite. 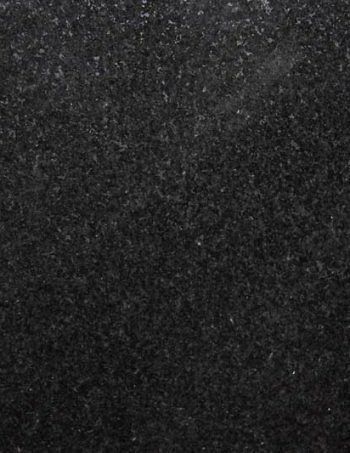 Absolute Black granite displays as the darkest of granite stones with beautiful strong black base and characteristics of minute specks of gray throughout the stone. Absolute Black is an attractive choice for kitchen counters,fireplaces or commercial usage. 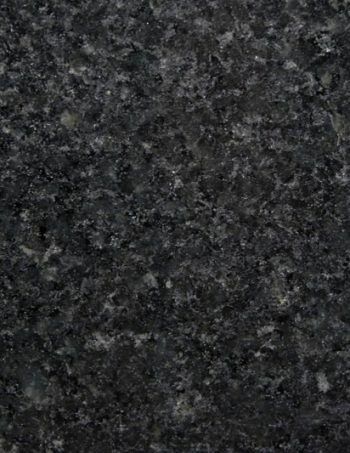 Color: Beautiful strong black base and characteristics of minute specks of gray throughout the stone Characteristics: Beautiful, Resilient, Stain and Scratch Resistant Popularity: Strong residential markets and commercial choice granite Cabinets: Absolute Black goes with most light to medium wood stain or white or lightly colored cabinets Grade: 1st grade, Premium Select Thickness: 3cm, 2cm *Absolute Black is a safe color for marketability and real estate investments. Remember to input the true (or best estimate) square footage amount in sq.ft box. A typical kitchen is 40-75 square feet. Kitchens with islands and bar tops can be significantly more. Vanity tops are typically 20-50 sq.ft. Also remember to calculate any backsplash (4 inch typical or full backsplash) in the total square footage. Click here to learn how to measure and calculate your countertops's true square footage. BLACK ARACRUZ- Beautiful, Resilient 3cm PREMIUM First Grade Black Aracruz is a popular type of granite.Black Aracruz granite displays as the darkest of granite stones with beautiful strong black base and characteristics of paintbrush grey throughout the stone. Black Aracruz is an attractive choice for kitchen counters,fireplaces or commercial usage. Color: Beautiful strong black base and characteristics of minute painbrush of grey throughout the stone Characteristics: Beautiful, Resilient, Stain and Scratch Resistant Popularity: Strong residential markets and commercial choice granite Cabinets:Black Aracruz goes with most light to medium wood stain or white or lightly colored cabinets Grade: 1st grade, Premium Select Thickness: 3cm, 2cm *Black Aracruz is a safe color for marketability and real estate investments. Remember to input the true (or best estimate) square footage amount in sq.ft box. A typical kitchen is 40-75 square feet. Kitchens with islands and bar tops can be significantly more. Vanity tops are typically 20-50 sq.ft. Also remember to calculate any backsplash (4 inch typical or full backsplash) in the total square footage. Click here to learn how to measure and calculate your countertops's true square footage. 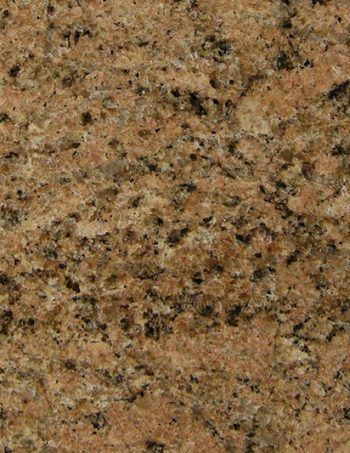 TAN BROWN- Beautiful, Resilient 3cm PREMIUM First Grade Tan Brown is a very popular type of granite. 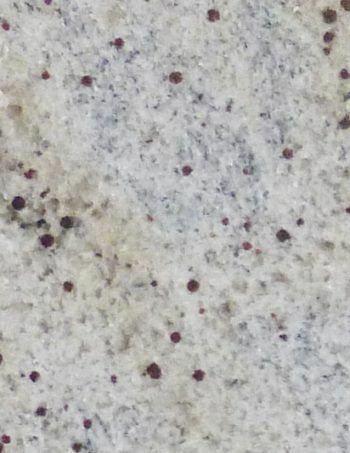 Tan Brown granite displays as an earthtone stone with a beautiful reddish brown and black base with characteristics of red brown spongy cork-like patches and black spots, with a very uniform or consist ant pattern throughout the stone. Tan Brown is an attractive choice for kitchen counters,fireplaces or commercial usage. 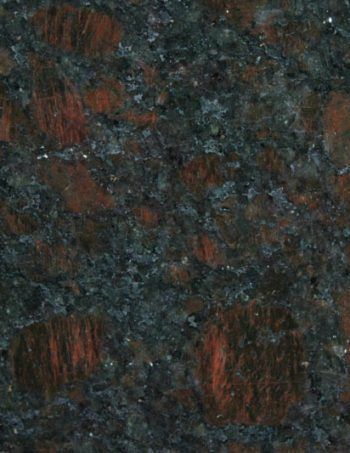 Color: Reddish brown and black base with characteristics of spongy cork-like patches and black spots Characteristics: Beautiful, Resilient, Stain and Scratch Resistant Popularity: Strong residential markets and commercial choice granite Cabinets: Tan Brown goes with most light to medium wood stains and white to medium colored cabinets Grade: 1st grade, Premium Select Thickness: 3cm, 2cm *Tan Brown is a safe color for marketability and real estate investments. Remember to input the true (or best estimate) square footage amount in sq.ft box. A typical kitchen is 40-75 square feet. Kitchens with islands and bar tops can be significantly more. Vanity tops are typically 20-50 sq.ft. Also remember to calculate any backsplash (4 inch typical or full backsplash) in the total square footage. Click here to learn how to measure and calculate your countertops true square footage. 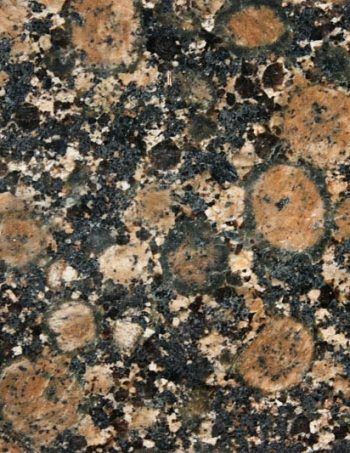 TROPIC BROWN- Beautiful, Resilient 3cm PREMIUM First Grade Tropic Brown is a very popular type of granite. Tropic Brown granite displays as an earthtone stone with a beautiful chocolate brown and black base with characteristics of brown, black spots, with a very uniform or consist ant pattern throughout the stone. 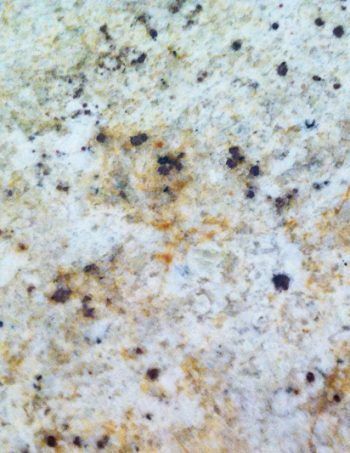 Tropic Brown is an attractive choice for kitchen counters,fireplaces or commercial usage. Color: Dark chocolate brown and black base- brown, black, and hints of white patterns Characteristics: Beautiful, Resilient, Stain and Scratch Resistant Popularity: Strong residential markets and commercial choice granite Cabinets: Tropic Brown goes with most light to medium wood stains and white or light colored cabinets Grade: 1st grade, Premium Select Thickness: 3cm, 2cm *Tropic Brown is a safe color for marketability and real estate investments. Remember to input the true (or best estimate) square footage amount in sq.ft box. A typical kitchen is 40-75 square feet. Kitchens with islands and bar tops can be significantly more. Vanity tops are typically 20-50 sq.ft. Also remember to calculate any backsplash (4 inch typical or full backsplash) in the total square footage. Click here to learn how to measure and calculate your countertops true square footage. VERDE BUTTERFLY- Beautiful, Resilient 3cm PREMIUM First Grade Verde Butterfly is a very popular type of granite like Ubatuba. Verde Butterfly granite displays as a dark and light hunter green base stone with beautiful characteristics of gold ribbons, larger white wisps and dark gray speckles. Verde Butterfly is an attractive choice for kitchen counters,fireplaces or commercial usage. Color: Dark and light hunter greens with wisps of gold, marblely white and dark gray speckles Characteristics: Beautiful, Resilient, Stain and Scratch Resistant Popularity: Strong residential markets and commercial choice granite Cabinets: Verde Butterfly goes with most dark/light wood stains and white or light colored cabinets Grade: 1st grade, Premium Select Thickness: 3cm, 2cm *Verde Butterfly is a safe color for marketability and real estate investments. Remember to input the true (or best estimate) square footage amount in sq.ft box. A typical kitchen is 40-75 square feet. Kitchens with islands and bar tops can be significantly more. Vanity tops are typically 20-50 sq.ft. Also remember to calculate any backsplash (4 inch typical or full backsplash) in the total square footage. Click here to learn how to measure and calculate your countertops true square footage. PEACOCK GREEN- Beautiful, Resilient 3cm PREMIUM First Grade Peacock Green is a very popular type of granite like Ubatuba. 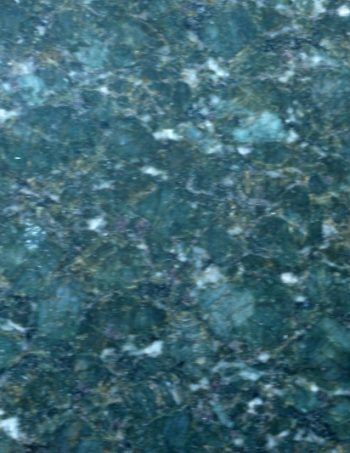 Peacock Green granite displays as a dark and light hunter green base stone with beautiful characteristics of small gold ribbons, white wisps and dark specks. 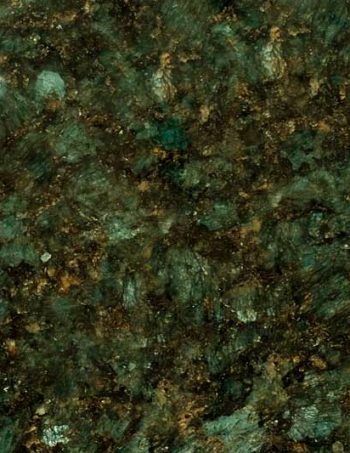 Peacock Green is an attractive choice for kitchen counters,fireplaces or commercial usage. Color: Dark and light hunter greens with hints of gold, white and black Characteristics: Beautiful, Resilient, Stain and Scratch Resistant Popularity: Strong residential markets and commercial choice granite Cabinets: Peacock Green goes with most dark/light wood stains and white or light colored cabinets Grade: 1st grade, Premium Select Thickness: 3cm, 2cm *Peacock Green is a safe color for marketability and real estate investments. Remember to input the true (or best estimate) square footage amount in sq.ft box. A typical kitchen is 40-75 square feet. Kitchens with islands and bar tops can be significantly more. Vanity tops are typically 20-50 sq.ft. Also remember to calculate any backsplash (4 inch typical or full backsplash) in the total square footage. Click here to learn how to measure and calculate your countertops true square footage. SILVER SEA - Beautiful, Resilient 3cm PREMIUM First Grade Silver Sea is a popular type of exotic granite. Silver Sea granite displays as an light sandy white with grey and a subtle green tint stone with a wavy ocean pattern throughout the stone. Silver Sea is an attractive choice for kitchen counters,fireplaces or commercial usage. Color:Light sandy white stone with a beautiful tints of green and silver grey in a wavy ocean pattern Characteristics: Beautiful, Resilient, Stain and Scratch Resistant Popularity: Strong residential markets and commercial choice granite Cabinets: Silver Sea goes with most medium to dark wood stains and colored cabinets Grade: 1st grade, Premium Select Thickness: 3cm, 2cm *Silver Sea is a safe color for marketability and real estate investments. Remember to input the true (or best estimate) square footage amount in sq.ft box. A typical kitchen is 40-75 square feet. Kitchens with islands and bar tops can be significantly more. Vanity tops are typically 20-50 sq.ft. Also remember to calculate any backsplash (4 inch typical or full backsplash) in the total square footage. Click here to learn how to measure and calculate your countertops true square footage. YELLOW NUT- Beautiful, Resilient 3cm PREMIUM First Grade Yellow Nut is a very popular type of exotic granite. 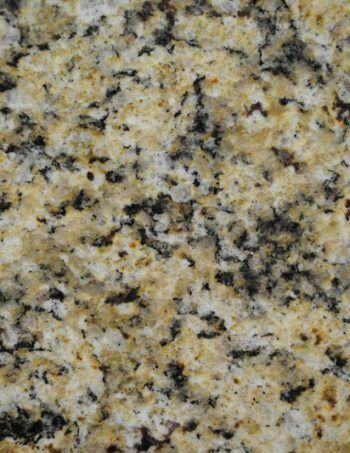 Yellow Nut granite displays as a beautiful creamy/beige and yellow with patches of white and sometimes raspberry. This is considered an exotic pattern stone with patches and veining throughout the stone. Yellow Nut is an attractive choice for kitchen counters, fireplaces or commercial usage. Color: Beige Yellow/Creamy, White and Raspberry exotic stone with patches and veining Characteristics: Beautiful, Resilient, Stain and Scratch Resistant Popularity: Strong residential markets and commercial choice granite Cabinets: Yellow Nut goes with most light, medium to dark wood stains and colored cabinets Grade: 1st grade, Premium Select Thickness: 3cm, 2cm *Yellow Nut is a safe color for marketability and real estate investments. Remember to input the true (or best estimate) square footage amount in sq.ft box. A typical kitchen is 40-75 square feet. Kitchens with islands and bar tops can be significantly more. Vanity tops are typically 20-50 sq.ft. Also remember to calculate any backsplash (4 inch typical or full backsplash) in the total square footage. Click here to learn how to measure and calculate your countertops true square footage. BLACK PEARL- Beautiful, Resilient 3cm PREMIUM First Grade Black Pearl is a popular type of granite. 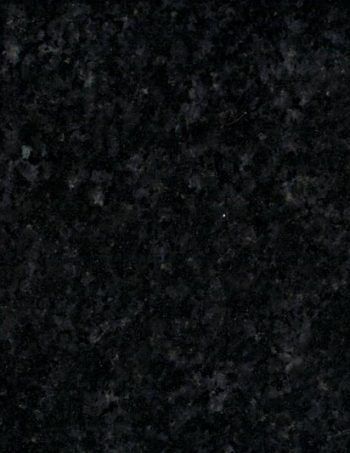 Black Pearl granite displays as a black granite stone with a beautiful strong black base and characteristics of sparkling pearly wisps throughout the stone. Black Pearl is an attractive choice for kitchen counters,fireplaces or commercial usage. Color: Beautiful strong black base and characteristics of sparkling pearly wisps throughout the stone Characteristics: Beautiful, Resilient, Stain and Scratch Resistant Popularity: Strong residential markets and commercial choice granite Cabinets: Black Pearl goes with most light to medium wood stain or white or lightly colored cabinets Grade: 1st grade, Premium Select Thickness: 3cm, 2cm *Black Pearl is a safe color for marketability and real estate investments. Remember to input the true (or best estimate) square footage amount in sq.ft box. A typical kitchen is 40-75 square feet. Kitchens with islands and bar tops can be significantly more. Vanity tops are typically 20-50 sq.ft. Also remember to calculate any backsplash (4 inch typical or full backsplash) in the total square footage. Click here to learn how to measure and calculate your countertops's true square footage. BLACK GALAXY- Beautiful, Resilient 3cm PREMIUM First Grade Black Galaxy is a very popular type of exotic granite. 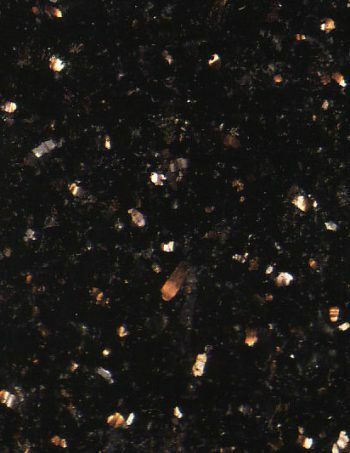 Black Galaxy granite displays as beautiful true black stone with characteristics of copper or metalic sparkling speckles throughout the stone to give an appearance like stars on a blackened sky. Black Galaxy is an attractive choice for kitchen counters,fireplaces or commercial usage. Color: Beautiful true black stone with characteristics of copper or metalic sparkling speckles throughout the stone Characteristics: Beautiful, Resilient, Stain and Scratch Resistant Popularity: Strong residential markets and commercial choice granite Cabinets: Black Galaxy goes with most light to medium wood stains and colored cabinets Grade: 1st grade, Premium Select Thickness: 3cm, 2cm *Black Galaxy is a safe color for marketability and real estate investments. Remember to input the true (or best estimate) square footage amount in sq.ft box. A typical kitchen is 40-75 square feet. Kitchens with islands and bar tops can be significantly more. Vanity tops are typically 20-50 sq.ft. Also remember to calculate any backsplash (4 inch typical or full backsplash) in the total square footage. Click here to learn how to measure and calculate your countertops's true square footage.